There is undeniable proof that the Irish people were sold out and betrayed by R2W Unions and TDs incl. Sinn Féin, PBP, Solidarity, Ind4Change, Social Democrats on the Water Charges issue. The RTE video of the 6th of April 2017 on the Dáil media plinth shows R2W TDs one after the other giving victory speeches. 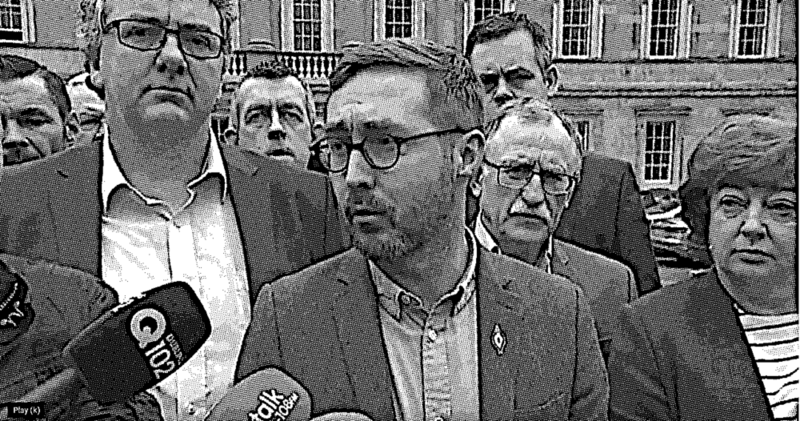 Deputy Eoin O'Broin states that indeed there is '“COLLECTIVE AGREEMENT” with the contents of the Oireachtas Committee on Water Charges report and they will now meet with the rest of the Committee in the dail in the afternoon to formally adopt it. It transpired at that meeting Simon Coveney announced he had written to the chairman of the committee the previous night stating that Fine Gael would not accept the draft report because an agreement on metering that they made with Fianna Fáil, one week previously, did not appear in the report. It is important to point out that the issue involved only ‘METERING’ and not ‘Charges For Excessive Use’ or any other clause including acceptance of Irish Water, agreed by all Committee members as stated in the draft report. It was this single issue on metering that R2W would eventually use to distance itself from the eventual water legislation. It is logical to assume that accepting the principle of ‘Excessive Use Charge’ that that would entail metering the amount of water used. Note that the ‘Excessive Use Charge’ principle was introduced as early as 2015 in Brussels by rapporteur Lynn Boylan supported by R2W, see this article Here. The Oireachtas Committee spent the next week addressing the metering changes and eventually the wording was changed to reflect the FG/FF agreement as mentioned by Simon Coveney in his letter. The Committee’s Final Report on Domestic Water Charges was passed on 11th of April 2017 by a majority of 13 to 7. 5 R2W TD'S, 1 Green Party Senator and 1 Labour Party Senator voted against. The only difference in the the Draft Confidential Report that the R2W agreed with and Final Report related to the change in wording on metering only. It did not include any rejection of ‘Charges For Excessive Use’ by the R2W TD's. It is critically important to understand that the part in the report that was modified had to do with a disagreement on metering details between FG and FF. and not the any agreed charging regime. It seems none of the committee members had any problem with the ‘Charges For Excessive Use’ as written in the Draft Report on the 6th of April and agreed to again in the final report on the 11th of April. The reason R2W TD's voted against the final report had to do with the modified details on metering alone. This final Oireachtas Committee’s Report on Domestic Water Charges, including the principle of charging for excessive use, became the official position of the Government and this eventually became part of the Water Services Act 2017 that passed into legislation in Sept 2017. R2W TDs, of course objected to the Bill. However, in my view, this was in truth a 'face saving ' exercise. By agreeing to ' Charges For Excessive Use ' the details on metering was a side show allowing them to jump up and down in false protest. The harm was already done and they had a major part in it. The Water Services Act was now included in the new River Basin Management Plan as the Irish Govt's official position on the new Domestic Water Charges for Ireland and this was forwarded to Brussels for approval. In a nutshell, R2W and affiliated TD's, by agreeing to commodify domestic water usage through the ‘Charges for Excessive Use’ principle, have facilitated the Government in their long term plan to activate Articles 102-106 of the Lisbon Treaty ( signed up to in 2009 ) that insists that all member states must open up to competition any goods/ services that are available on the open market at unit price ( e.g cost per litre of water ). This will align Ireland with the EU Single Market opening up domestic water charging to competition laws. This will in turn do away with our precious 9.4 Domestic Water Exemption. R2W Unions and the R2W TD's should never have agreed to this. They should have ignored completely the Government signing up to the ‘Memorandum of Understanding’ and they should have fought tooth and nail to retain the 9.4 Exemption. Instead they handed the Government water charges and privatisation on a plate. Perhaps this is the price you pay as advocates of the EU and the Single Market. "Much criticism has been made of a number of TD’s who support Right2Water declaring a victory on the plinth of the Dail on 5th April 2017. At that particular time, the Joint Oireachtas Committee on Water had agreed a draft report stating that charges were to be abolished, mandatory metering would end and the referendum to enshrine public ownership of our water supply would take place. Had that Report been adopted, it would indeed have been a massive victory for everyone who had campaigned against water charges. Instead, Fianna Fail and Fine Gael conspired to change the report outside of committee hearings, a scandal in itself, undermining the democratic processes of the Oireachtas, and not for the first time. In the same week, Simon Coveney, the Minister responsible for water, issued threats to the committee when he wrote to the Chair "
The fact of the matter is FF and FG conspired to change the report on metering but nothing to do with the core part of the report which included the Charges For Excessive Use and acceptance of Irish Water. The statement was an example of a premeditated manipulation of the truth by R2W. People should not allow them or affiliated TD's to continue to treat them as fools. If we are to progress and counter the status quo EU austerity measures then any opposition must embrace honesty, democracy and a little bit of humility. Without this the often cacaphony of ‘Unity’ is false. I have shown beyond doubt that the R2W TD's sold out the people and the Irish Water Charges Movement by agreeing the ’ Excessive Use Charge’ principle. The metering issue between FG/FF was and is still being used as a smokescreen to hide a shameful truth. R2W conspired behind the backs of the movement by not being upfront and honest and were complicit for whatever reason in not only undermining our 3 core principles 1. No Water Charges 2. No Metering and 3. No Irish Water company. In my view they quite rightly denigrated Fianna Fáil and Fine Gael for their political shenanigans but it is shameful that they deny their own culpability. The march passed off peacefully with marchers clearly enjoying themselves chanting slogans all along the route, such as 'Enda Enda Enda Out Out Out', 'No Way, We Won't Pay', Ruth Coppinger TD told the people that this was the start of the next phase of the campaign, non payment. She said that the Non Payment Network will be holding many more demonstrations throughout the country. There was a symbolic binning of Irish Water bills at Leinster House. According to Ruth Coppinger, many people had still not received irish Water bills. Non Payment Network, organisers of the national demonstration against Irish Water and the water charges were delighted with the massive turnout. Demonstrators gathered in lovely sunshine at the Garden of Remembrance, Parnell Square and then marched to Dail Eireann, Leinster House where they were addressed by several speakers including Ruth Coppinger and Paul Murphy of the Anti Austerity Alliance. The woman was sitting in a doorway at Fingal County Council. A WOMAN HAS made a statement to gardaí after she was left bloodied at an anti-water charges protest today. The woman was one of four protesters who had lodged themselves in a revolving door at Fingal County Council this afternoon. A video posted on the Dublin Says No Facebook page shows gardaí attempting to remove the protesters. There is some resistance and the sound of glass shattering, though the video does not show how it happened. A second video shows the woman being escorted from the offices by security staff and gardaí, her face and clothes bloodied. a lot of blood. He said that people had a right to protest. “minor injury”, being treated on scene. The matter is being investigated by gardaí. Fianna Fáil councillor Darragh Butler said Monday’s council meeting went ahead as planned, with the protest having no effect on the evening’s business. He said he counted about 15 to 20 protesters outside the county hall and about eight gardaí. He said the costs of providing security at meetings was an “awful waste” of council money. “I have no problem with peaceful protest but clearly when you jump over or go around three different barriers, that’s not peaceful protest,” he said.